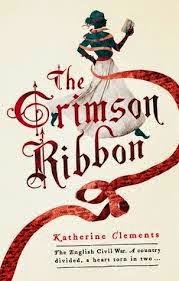 The Crimson Ribbon is a very well written and researched debut historical novel by Katherine Clements. The supreme test of a historical novel is how well the author blends fictional characters with real-life figures and events. The Crimson Ribbons passes that test. The central character of the book is Ruth Flowers a very believable creation of the author‘s imagination. Flower’s life intersects with the real life figures of Oliver Cromwell and Elizabeth Poole. Clements treatment of Cromwell and Poole is very disciplined and accurate. It is always tempting for a novelist to play fast and loose with history and historical figures. Cromwell is a very well-known and written about the character and does not play a too greater part in the book. Poole, on the other hand, is not well known, and Clements has a bit more space to creatively explore her life. The opening chapter of the book is probably the most violent I have ever read and explores the treatment of women who stepped out of line with the authorities. The English revolution brought about a significant politicization of all sectors of society none more so than females. In the 17th century, England women were allowed to be seen but not heard. While it was dangerous for men to question the existing political and economic setup, for women at the beginning of the 17th century, it was nearly impossible. But women of all classes managed to be heard and some cases very loudly. The explosion of printing presses enabled women with little money to spread their ideas and propaganda to a wider audience than ever before. But this had a firm price. The ruling elite correctly saw this radicalisation of women as a direct threat to their power and privileges. The women who spoke up, formed groups and joined the radical parties such as the Levellers Fifth Monarchists and even Baptists or Quakers were seen as a plague and in many cases labeled witches. The book highlights the precarious nature of women who step outside the bounds of society. The descent into poverty, prostitution and sometimes death was all too real. Given the growth, today of young women who for one reason have left their family home and have descended into poverty and homelessness with little protection from the state shows that despite the novel being set in the 17th century it has a contemporary feel to it. Having read her writings, it is clear that Poole was a very political young woman. She was close to a few of the radical groups that were prevalent at the time. It has been said that she was close to the Fifth Monarchists. Poole’s main claim to fame was her intervention into the debate over the fate of Charles 1st. According to Manfred Brod. “It was this situation that Elizabeth Poole entered towards the end of December as a kind of consultant prophetess. After some preliminary hearings of which little is known, she was received in a plenary session of the council of officers on 29 December. She told of a vision she had had, in which the army, as a healthy young man, cured the nation, as a sick woman, of its disease. The power of the army, she explained, came from God and must not be given away. Several officers, including Ireton, spoke to approve of her presentation. Immediately afterwards, Lilburne came in with a petition, A Plea for Common-Right and Freedom, which contained detailed proposals for the conversion of the council of officers to a national executive body. Plainly, Poole had been brought in to play a mediating role between officers and Levellers”. “ I Have considered the agreement of the people that is before you, and I am very jealous lest you should betray your trust in it (in as much as the Kingly Power is faln into your hands) in giving it up to the people; for thereby you give up the trust committed to you, and in so doing you will prove your selves more treacherous then they that went before you, they being no wayes able to improve it without you. You justly blame the King for betraying his trust, and the Parliament for betraying theirs: This is the great thing I have to say to you, Betray not you your trust ”. She then according to Brod in 1653 “ Poole forced her way into the pulpit of the chapel of Somerset House in London and preached for Lilburne, then on trial for his life. The congregation was a socially prominent one, and the action was widely and sensationally reported in the newsbooks”. Despite being strong on plot and history, there is a major weakness in the book which is the near absence of politics. Clements use of real figures such as William Kiffin (1616–1701), while being historically accurate leaves out his political relationship with characters like Poole. Kiffin in Clements book is correctly portrayed as being extremely hostile to Poole’s personal indiscretions his real hostility is her perceived association with the radical groups especially the Levellers and Fifth Monarchists, according to Michael A. G. Haykin “During the late 1640s and 1650s Kiffin emerged as a skilled spokesman for the fledgling Baptist movement. In 1646 Kiffin and Knollys were involved in a public debate in Coventry with two paedobaptists, John Bryan and Obadiah Grew. Kiffin was a signatory to the dedication in Walwins Wiles (1649), an attack on the Levellers usually attributed to John Price”. Historical novels are notoriously hard to place within the current historiography of the English Revolution. Academic work is easier. While carrying out research Clements mentions Christopher Hill as one of her influences. Hill despite being an academic historian belonged to a group of Communist Party historians who pioneered the history from below genre. Clements book is a historical novel from below. Personally, I liked the book. It works on two levels it is a very well written book, and the storyline is plausible. The history is well researched and accurate up to a point. An examination of the politics of the characters in the book would have made the book a better read. Apart from this nit picking, I would recommend the book to those interested in the subject. The Crimson Ribbon has been extensively reviewing both in the mainstream media and given the number of blogs mentioned in the blurb quite heavily in the blogosphere deserves a wide readership.